TWO TEENAGERS AT a disco in West Cork could have died due to their level of alcohol intoxication, an emergency medicine specialist has said. The Irish Examiner reported this morning that a dozen “drunk children” attended an underage alcohol-free disco at Bandon Rugby Club in West Cork last Friday. 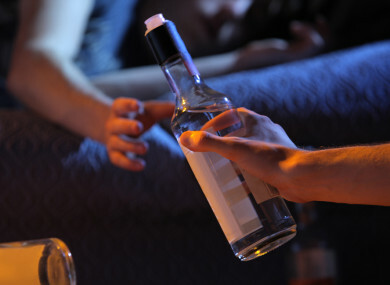 Teens were searched at the door and anyone who arrived drunk was directed to a dressing room where they were monitored. Medical back-up as also called in to attend to a number of severely intoxicated teenagers. Dr Jason van der Velde, a pre-hospital emergency medicine specialist, went to the rugby club to assess the condition of the youths, many aged around 16, and set up a field hospital to treat them. He described the scene when he arrived as a “vomatorium”. He told RTÉ’s Sean O’Rourke programme this morning that he was not exaggerating when he said that two of the children had the potential to die at scene due to excessively high blood pressure and difficulty breathing. “We’re not talking about a little bit tipsy, we’re talking about absolutely paralytically, unconsciously drunk,” he said. Two teenagers were sent by ambulance to CUH where they needed overnight care and treatment. Some of the unconscious youths had naggins of vodka concealed in their socks, he said, and dismissed the suggestion that drinks may have been spiked. Van der Velde said Bandon Rugby Club had run the event very well and praised its efforts to assist those trying to help around a dozen or so very drunk teenagers. Dr Chris Luke, a consultant in emergency medicine at Cork University Hospital also praised the efforts of Dr van der Velde for managing to keep many of the teenagers from needing to attend a packed emergency department. He told RTÉ that emergency staff in the emergency department are “basically worn out”. He said parents of teenagers need to “get a grip” and recognise that their children may engaging in this kind of behaviour. Email “Doctor says 'paralytically, unconsciously drunk' teens at West Cork disco could have died”. Feedback on “Doctor says 'paralytically, unconsciously drunk' teens at West Cork disco could have died”.